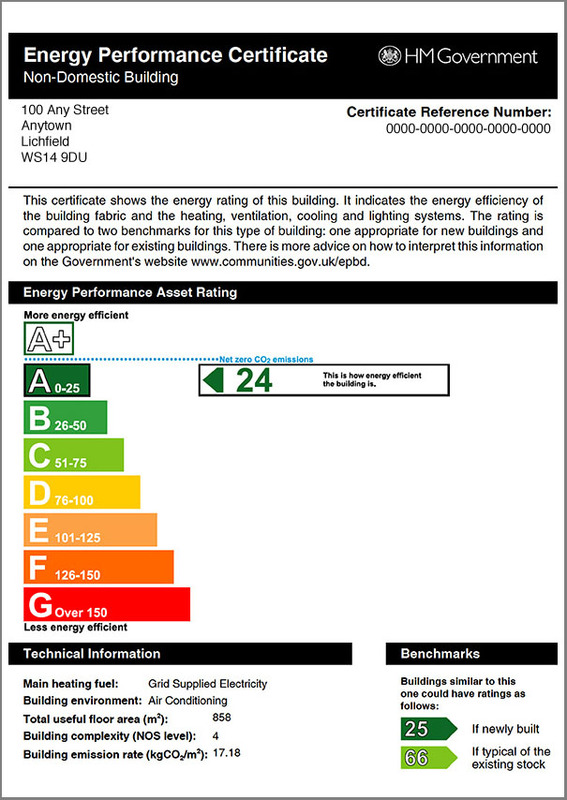 The EPC shows the energy efficiency rating (relating to running costs) of a property. The rating is shown on an A–G rating scale similar to those used for fridges and other electrical appliances. The EPC includes recommendations on how to improve the energy efficiency. There is no statutory requirement to carry out any of the recommended energy efficiency measures stated. The EPC may also include information showing which of these measures would be eligible for finance under the Green Deal scheme, if required . EPCs for non-dwellings must be produced by an accredited non-domestic energy assessor, who is a member of a government approved accreditation scheme. the seller or landlord must provide an EPC free of charge to a prospective buyer or tenant at the earliest opportunity. A copy of the EPC must also be provided to the successful buyer or the person who takes up the tenancy . Estate agents and other third parties must ensure that an EPC has been commissioned before they can market a property for sale or rent. In addition, all advertisements in the commercial media must clearly show the energy rating of the building (where available).